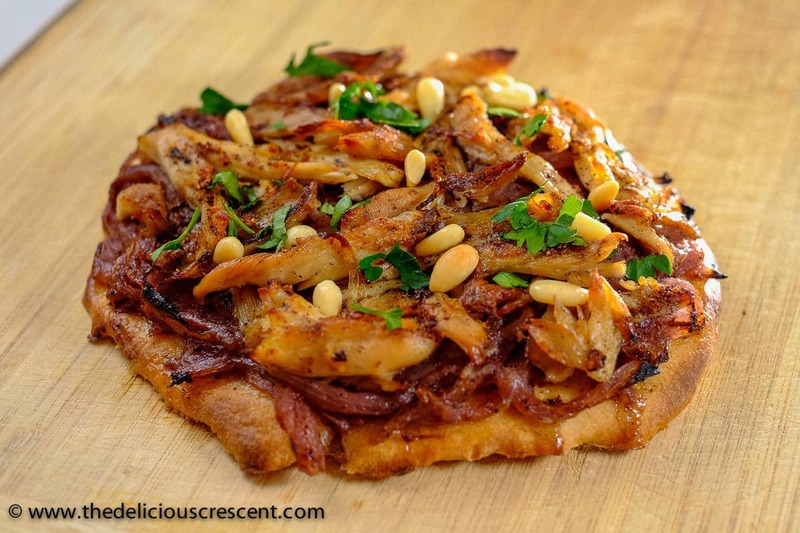 Sumac chicken caramelized onion flatbread (Musakhan) is a slightly adapted version of the popular Mediterranean recipe made with roasted chicken thighs, full of flavorful spices and healthy. Makes a great homemade appetizer or pizza style! Musakhan has been sometimes referred to as a national dish of Palestine. It is simple, comforting, uses few ingredients, yet complex and captivating in taste. The compelling flavor of caramelized onions, the tartness of sumac, the mellow taste of olive oil, the spice overtones and the crunchy pine nuts; all enveloped around the nicely roasted chicken over fresh baked bread is truly a winner that makes it a national dish! There are different ways to prepare this dish. But I have made some adaptations, retaining the overall flavor profile of this dish. 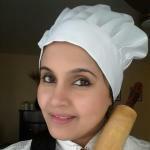 For the sumac chicken flatbread recipe below, I had baked some mini musakhan flatbread at home. I have enhanced the nutrition of the homemade bread by adding wheat bran and flaxseed meal to the dough. However, the bread portion can be easily substituted with some store bought flat bread. 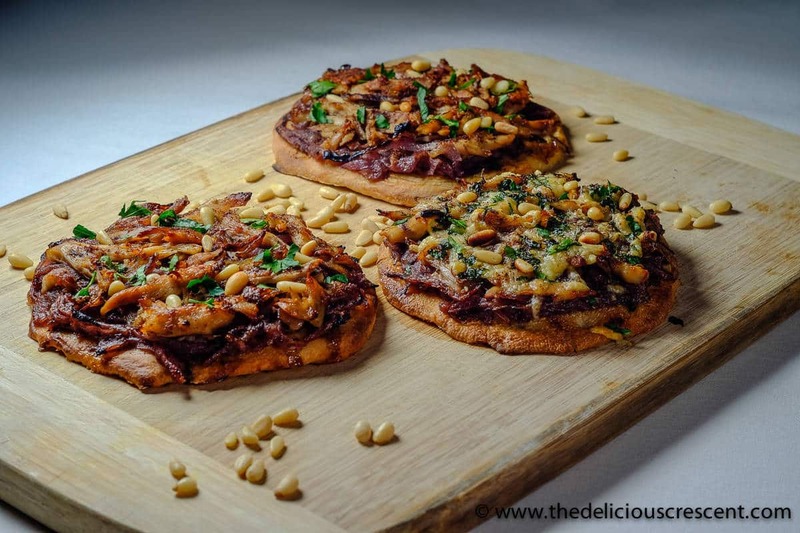 While I thoroughly enjoyed preparing and eating this sumac chicken caramelized onion flatbread, it is a greater pleasure to be able to discuss about its nutrition value and share it. Here I will discuss about two ingredients – onions and sumac – both known for their versatility, flavor and nutrition value. I have previously discussed about pine nuts in my post – Tabbouleh salad with pine nuts. Sumac is a spice that is popularly used in the middle-eastern cuisine. It is essentially a coarse powder ground from the deep reddish purple berries produced by the sumac bush. It is a versatile spice that adds bright color, a tangy lemony flavor and is used to flavor a variety of dishes – dips, salads, rice, kebabs, stews, breads and much more. Several studies have shown that sumac berries have exceptional antioxidant properties that are attributed to the phytochemicals present in the berries. One study that looked at various commonly used eastern spices, concluded that of all the spices studied, sumac had the highest antioxidant activity, the highest concentration of total phenolic compounds and the strongest antibacterial activity. Onions are versatile and are used to add flavor to a variety of dishes across the world – by almost all cultures and traditions. They are part of the allium family of vegetables that include garlic, leeks, chives and green onions. These vegetables have been studied extensively and have particularly shown promise with stomach and colorectal cancers. I have previously discussed about leeks in my post about Moroccan style poached eggs. Onions are low in calories, high in vitamin C, and a good source of fiber, vitamin B 6, manganese, and quercetin – a potent antioxidant. They are rich in flavonoids and organosulfur compounds, which have been attributed to a range of health effects which include anticarcinogenic properties, antiplatelet activity, antithrombotic activity, antiasthmatic and antibiotic effects. While peeling onions, make sure to peel as little of the outer layers as possible, because the flavonoids are particularly concentrated in the outer layers. This sumac chicken onion musakhan is truly a well balanced dish with healthy fats, good amount of fiber, plenty of protein from the chicken and lots of flavorful onions topped with antioxidant rich sumac! Do you make any middle eastern foods at home? 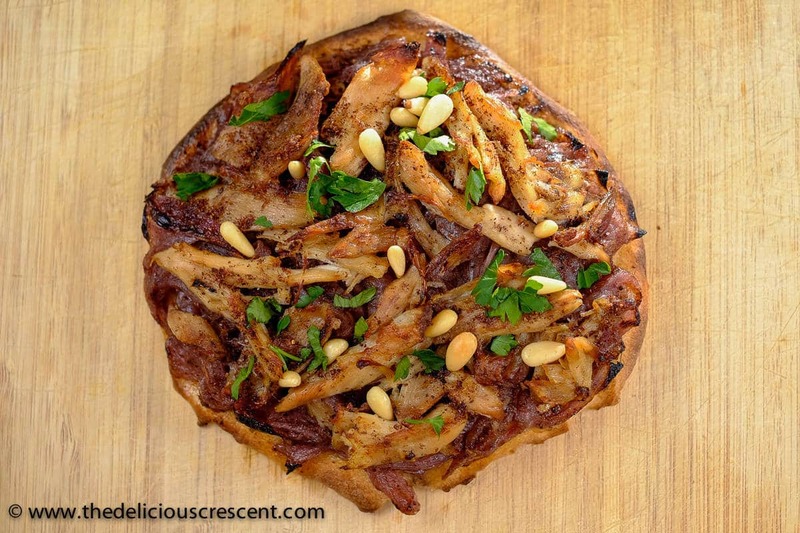 Did you try this “Sumac chicken caramelized onion flatbread (Musakhan)”? Take a large wide thick bottomed sauté pan and heat the olive oil (reserving two teaspoons olive oil for the chicken). Add the sliced onion and sauté slowly on medium heat until caramelized. Make sure to check the progress to prevent the onions from getting burnt at the bottom. Do not be hasty with this step. Allow enough time for the onions to cook and develop the flavor. Add the sumac towards the end of this process of caramelizing the onions. Once done, set aside the caramelized onions. Sprinkle one teaspoon of olive oil on the chicken thighs and coat well. Season with salt and black pepper. Brown the chicken thighs on both the sides, at high heat in a non stick ceramic coated frying pan. It should take only a few minutes to brown both sides. The idea is to sear the chicken and give it some flavor. Transfer the seared chicken, grated garlic, cardamom, cloves and bay leaves to a cooking pot. Add 1 cup of water. Bring it to a boil, then lower the heat and simmer for about 20 minutes. Add one tablespoon of the caramelized onions to the chicken and stir. Let it simmer until the chicken is well done. Turn off the heat. Using a fork separate the cooked chicken meat from the bone. Stir the remaining one teaspoon olive oil with the chicken and set aside. This will help the chicken with browning, while broiling or baking at a later stage. Adjust salt and pepper as needed. Reserve the broth from the chicken. Take the caramelized onions and stir couple tablespoons of chicken broth into it to just make it a bit moist, but not runny. Add just a little salt to season as per taste. Essentially this is going to take the place of the sauce that is used on a pizza - so keep it thick and chunky, not thin or runny. Take the warm water, sprinkle the yeast over it. Scatter the sugar on the top. Let it stand in a warm dark place for about 5 minutes until the yeast bubbles up on the top. Add about two cups of bread flour, salt and mix it using the dough attachment in a stand mixer, if available. The mixture will be a bit pasty/sticky. Then add the wheat bran and flaxseed meal, and let the machine knead at medium setting for about 5 minutes. If needed, add some flour, a little at a time (a tablespoon or so) to make sure that the dough is not sticky. It is important to not add too much flour, so take time and add the flour slowly, just as needed. When the dough is well kneaded and not sticky, let it rest and allow it to rise for about an hour to double in volume. Then punch the air out and divide the dough into eight portions. Take each portion and roll it out into a mini pizza like disc that is about 1/4 inch thick. Let it rest for 15 minutes, until the dough swells up a little. Using a fork make deep pricks all over. This is to ensure that the disc does not puff up like a pita while baking in the oven. Take a flat baking sheet lined with parchment paper and place the mini musakhan loaves over it and slide it into the oven. Bake for 5 to 6 minutes until well done. Check to see if it needs 1 to 2 minutes more. The baking time will depend on the oven. Turn on the oven to broil at high. Spread about 1/8th of the onion mixture over each mini musakhan loaf and top it with about 1/8th of the chicken mixture evenly. Broil the mini Musakhan, a few at a time on a parchment paper lined baking sheet, for about 3 to 5 minutes as needed per the oven. The chicken should brown a little while broiling. 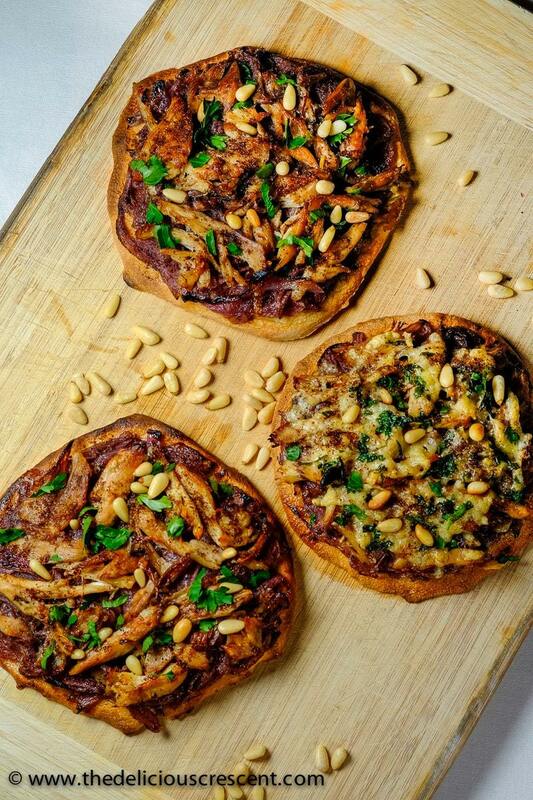 If you prefer, you could make a variation, topped with some cheese to make mini musakhan pizza. Sprinkle the toasted pine nuts, chopped parsley and more sumac (if you like). 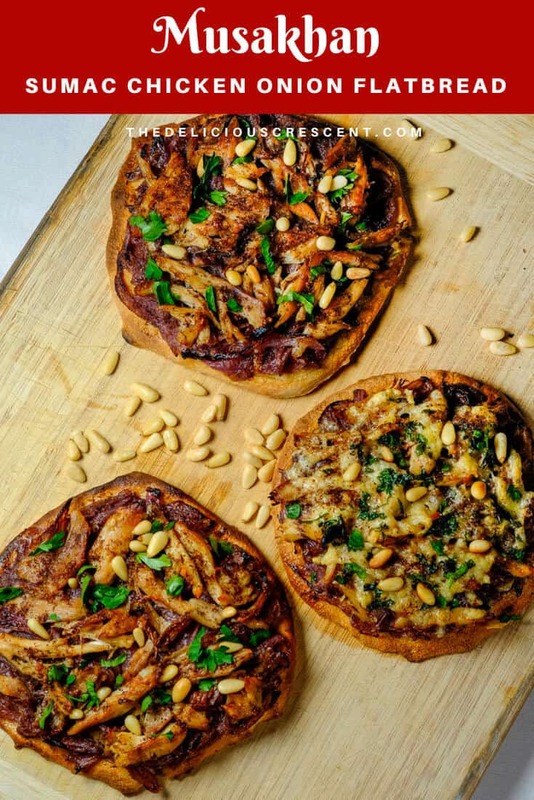 Enjoy sumac caramelized onion mini musakhan! Thanks for this ! It was an amazing dish and experience using sumac for the first time at home. We will be making it again. We tried it like a pizza with your onions and chicken as a topping with tomato sauce and mozzarella cheese thinking the kids would like it better, but we all actually the liked your original better, even the kids. Thank you a again ! Thanks so much for your lovely feedback. I am absolutely thrilled to know that even the kids liked it – that’s the best feedback ever :) I also like the onions and chicken version with some cheese on it.